By Scott Gilfoid: Amir Khan (31-3, 19 KOs) says he’s going to put aside his friendship with former eight division world champion Manny “Pacman” Pacquiao (57-6-2, 38 KOs) so that the two of them can face each other in early 2016 fight in the United States of America. Khan says that he has to put the friendship aside so that the two of them can face each other. Obviously, it’s a payday fight for Khan, and I don’t see the fight actually proving that he’s the best welterweight or anything like that. If Khan gets thrown in the ring with the likes of Keith Thurman, Shawn Porter, Danny Garcia, Errol Spence or a rematch with Marcos Maidana, I suspect that Khan would be knocked out just the same as he always would if he fought those guys right now. The only thing Khan will be proving by fighting Pacquiao now is that he can beat a 36-year-old fighter who is coming off of a very serious right shoulder injury and a loss to Floyd Mayweather Jr. In other words, I don’t see Khan getting much credit if he beats Pacquiao other than from the casual boxing fans who might not be aware that Pacquiao is 36 and was recently injured and beaten by Mayweather. “I want to fight Manny Pacquiao,” Khan said to the dailymail.co.uk. “Me and Manny have been friends for a long time but sometimes you have to put friendship to one side. We’ve done plenty of rounds together…with what I’ve learned in the last few years, I can definitely…beat Manny Pacquiao,” Khan said. I don’t really see much that Khan has learned in the last three years. I mean, Khan hasn’t fought anyone good since his loss to Danny Garcia in 2012. Khan’s fights in the last three years have been against mostly safe opponents without much punching power, or too old and small to beat him. Look at the guys that Khan has fought in the last three years and you tell me where the danger and quality is: Little 5’5” Carlos Molina, Julio Diaz, Luis Collazo, Devon Alexander and Chris Algieri. Those are all B and C-level fighters. Those aren’t the cream of the crop welterweights. Where’s Errol Spence, Marcos Maidana, Shawn Porter, Tim Bradley, Keith Thurman and Danny Garcia? Khan just beat a bunch of lower level guys, and now he’s yakking like he actually accomplished something like finding a cure for cancer. I don’t see what Khan had learned in the last three years that would make it a problem for Pacquiao to whip him from pillar to post next year. 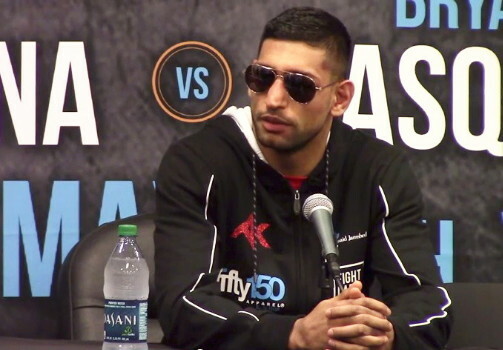 Khan just barely beat Chris Algieri last April in a fight that could have gone either way. Khan’s win over Julio Diaz in the UK was controversial with many boxing fans thinking that Diaz should have won. I had Khan losing that fight. Fans need to watch that fight with the sound turned down to cut off the crowd noise and the round by round description of the fight by the broadcasters. Diaz should have won. Khan could very well have a record of 3-2 in his last five fights, and here is bragging that he’s learned stuff in the last three years that would help him beat Pacquiao. I don’t believe it. We still don’t know if Khan will even be fighting Pacquiao next year, Yeah, Pacquiao’s elderly promoter Bob Arum has been talking about a fight between Khan and Pacquiao taking place, but he’s also been talking about wanting Pacquiao to fight other guys too like Juan Manuel Marquez and Terence Crawford. The fact that Arum is mentioning other guys as well as Khan makes me think that we could see Pacquiao fight one of those guys instead of Khan. I just hope that when/if that does play out like that, Khan takes the news well and doesn’t go to pieces and start blubbering about it. He needs to keep a stiff upper lip and move on and not sit back and bellyache, complain and make with the water works if Arum announces that Pacquiao will fight someone else instead.